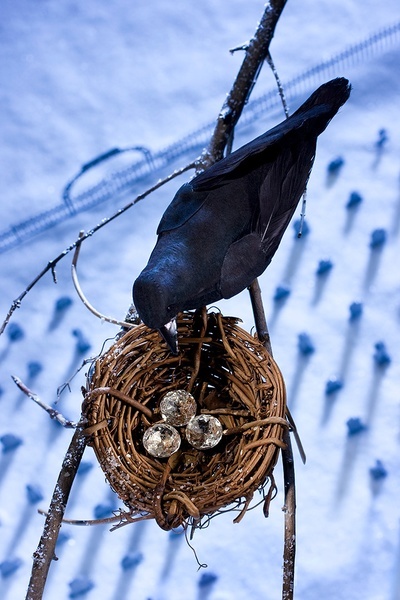 Grace Weston’s staged vignettes combine the whimsical with a delightfully dark sense of humor. Carefully constructed and lit with precision, Weston’s images are composed of familiar objects — toys, doll house furniture, artificial birds and decorative trinkets — but her worlds exist in such completeness that each forms a miniature reality. It is this fullness of vision that makes her work so compelling — each frozen scene is like a single line from a story. But for Weston the picture is always bigger than her constructed scene -- each image speaks to a psychological landscape, representing an internal dilemma, made real (and often funny) for the camera. We’ve just added 7 new images to a few of our all-time favorites in Weston’s Photographer’s Showcase portfolio, and took this opportunity to ask Weston a few questions about her work. photo-eye: Your images rely on scenes you’ve constructed using toys. Can you describe your conceptual and technical processes? Grace Weston: Despite having no people in my images, my subject matter is the human psyche. My work tends to reflect my observations of the contradictory and curious world of human beings. I find it is our foibles that make us an interesting, odd, humorous species, and there is endless inspiration for imagery. I keep a mini sketchbook on hand at all times, writing down or sketching ideas that come to me, often at odd moments. Sometimes I will jot down a phrase or a title, with no image in mind yet. Other times I’ll sketch a more fully formed idea, leading me to create or search for the props I need. Then again, at times a prop I come across will inspired a scenario. Once I decide on a scene to depict, I think about the mood I want to evoke, and the choices for lighting, optics, and the color palette. The shot continues to evolve as I work in the studio. I prefer to create effects and illusions in camera as much as possible, although I have used Photoshop to create lightning or fire. For me the fun is in the sleight of hand of the studio work. PE: What started you on the path of making images in this manner? What do you prefer about photographing constructed scenes as opposed to those you would encounter in your everyday life? GW: After years of treasure hunting man-made environments to photograph on location in black and white, I had the opportunity to assist a studio photographer. Certainly this introduced me to lighting and studio techniques, but much more importantly was the life-changing shift from searching for existing scenes out in the real world to starting with a blank canvas to make my own world. I was thrilled by the prospect of creating images from my imagination, and immediately knew this was the right fit for me. Technically, there was a steep learning curve, but creating illusion by manipulating light and optics has a sense of magic to it and I was very attracted to that. I enjoy depicting the things that confound or amuse me in our world: the contradictions, the character flaws, the psychological challenges of being human. I am drawn to the theatricality involved in creating a fictional vignette, inventing my characters, invoking relationships, and building a heightened situation. Additionally, with photography’s history as a recorder of proof, I get a particular pleasure by turning it on end, photographing fictional scenes while still expressing truth. PE: Select an image and tell us its back-story – what was the inspiration behind it? How did it come together? What about it makes you feel like it’s a particularly great image? 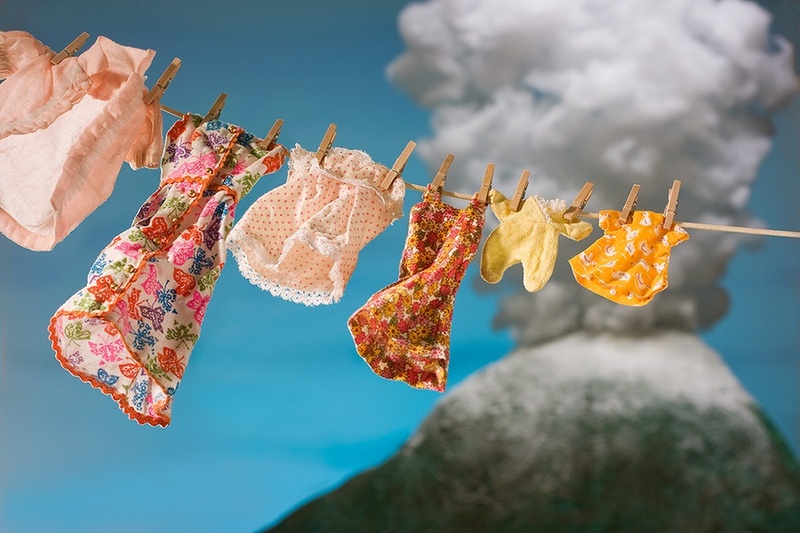 GW: Laundry Day was inspired by the thirtieth anniversary of the eruption of Mt. St. Helen in Washington State. As humans, we desire control, and struggle everyday towards that elusive goal. The mundane nature of hanging the clean laundry up to dry on a picture perfect summer day – what could go wrong? Of course, the fine abrasive ash from Mt. St. Helen ended up traveling far and wide to settle over countless acres, crossing many state borders. The mountain is made of plaster, cotton batting is the plume. I found and made doll sized clothes in the palette I wanted for the clothesline. Getting the garments to waft just right in the “wind” and stay in place for the composition was a challenge I solved by soaking them with a starchy liquid, and forming them into shape as I dried them with heat. At this scale a shift of a fraction of an inch can throw the composition out of balance or introduce an unwanted tangent, and the clothes were constantly shifting position. It definitely takes a certain type of personality to do this kind of work! To emphasize the contrast of the sunny day with the oncoming doom I applied very different lighting on the laundry line than the mountain. For me, lighting the set is like icing the cake. The painstaking work of setting the stage can be almost complete, but until the lighting is applied, it looks very dull and underwhelming. Lighting is what breathes life into the scene. I feel the color palette, the lighting, and the breezy clothes successfully create the over-the-top cheeriness of the sunny day to contrast to the volcano’s ominous plume. I enjoy luring a viewer into an image with beautiful color and lighting, opening to a darker psychological meaning. This image delivers a metaphor, the Sisyphean nature of the human quest to be in charge. Grace Weston was also recently interviewed for Oregon Public Broadcasting's Oregon Art Beat. You can see the video here. When we were still living in inwood park apartment homes, I used to hang out with an amateur photographer who's into macro shots. Her usual subjects are printed upholstery couches.